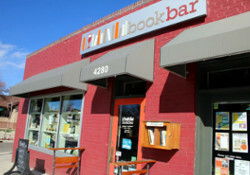 The idea of combining a book store and wine bar came to owner, Nicole Sullivan, like a bolt of lightning one day while reading a book and drinking a glass of wine. Who among us does not like wine and books and books with wine? About a dozen years later, after meandering through a few different careers, culinary school, marriage and motherhood, BookBar began to take shape.